For those who have recently come across the Polish death metal act known as Behemoth, which are known best for their earth shattering growls, Middle Eastern influences, and downright furious nature that explores different theological ideals while keeping an anti-Christian focus, may have been kept in the dark compared to fans who started with the group from the beginning. In its earliest years, Behemoth was a black metal band with a much grittier and rougher sound that was just as harsh on the ears as it is today... but it lacked conviction. Over time the band progressed more and more into their death metal outlet that has made them the shining example in metal that they are today. But, there were a few 'experimental' notches that came about that were only available for a short while before disappearing from the market. The EP's 'Conjuration' and 'Slaves Shall Serve' apparently have been hallmarked as 'in much of demand’, so Metal Blade decided to release both EPs together with a few extra tracks under the new moniker 'Abyssus Abyssum Invocat’. Altogether, this is a good and bad thing. If one is an avid Behemoth fan, they either already purchased all the albums, have these two EPs already, and maybe even picked up a live album too such as 'Live Apostasy' or checked out clips on Youtube. Hence, the need to hear 'Abyssus..’ is empty and invalid. For those who haven't done any of the list mentioned above, then here is what to expect. For one, there are quite a few covers between these two EPs that really bring out a different side of Behemoth. Songs like "Wish," originally done by Nine Inch Nails, feature Nergal and company taking their talents at singing, versus growling, which will either come off as an impressive attempt or purely laughable (if one is more preferable to the death metal side of things, then this will not be appealing). There is a lot of singing, or rough singing, for that matter when it comes to the cover tracks, from Venom's "Welcome to Hell" to Danzig's "Until You Call on the Dark" Behemoth do a great job at keeping the original style of the music intact while adding their own sound and aggressive pace to it, but the fact they try to keep the vocals the same does the band of service of not destroying the original (as some metal bands will try to turn heavy metal classics into death metal and it just sounds awful). Some of the cover tracks are done in a more death metal based formation such as "Penetration" by The Nefilim and suit Behemoth's later style much better, but overall the sound still clings to the original. 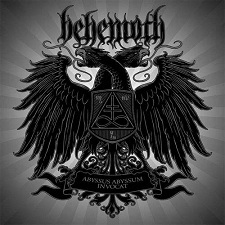 Ultimately, this collection of Behemoth music is decent, but only meant for heavy collectors or recent fans who only heard the last two albums 'The Apostasy' and 'Evangelion' and want a taste of Behemoth live and doing covers, but they may be disappointed. Another slight annoyance on the 'Abyssus..’ collection is the repetition of some live tracks which really don't show any difference at all in sound or place; either it was a mistake or intentional test but it could have easily been subbed out for a different, more efficient live piece. Still, other little qualities such as new artwork and linear notes are always tasteful to some fans and may make up for the shortfalls of some of the music to round out the entire experience of these two rare EPs once again.